If the trouble persist, go back to Paul's build which is very stable until a new fix is made available on R26099. 1.2.9 - Removed extrat comment lines et optimized some process. 1.2.5 - If priority.exe isn't installed, thread priority can be enabled using rexx "SysSetPriority"
- Enabled Extract images from video file (BMP or JPG or PNG). Default 1 image (or Frate) per seconds with a default number of 10 images. 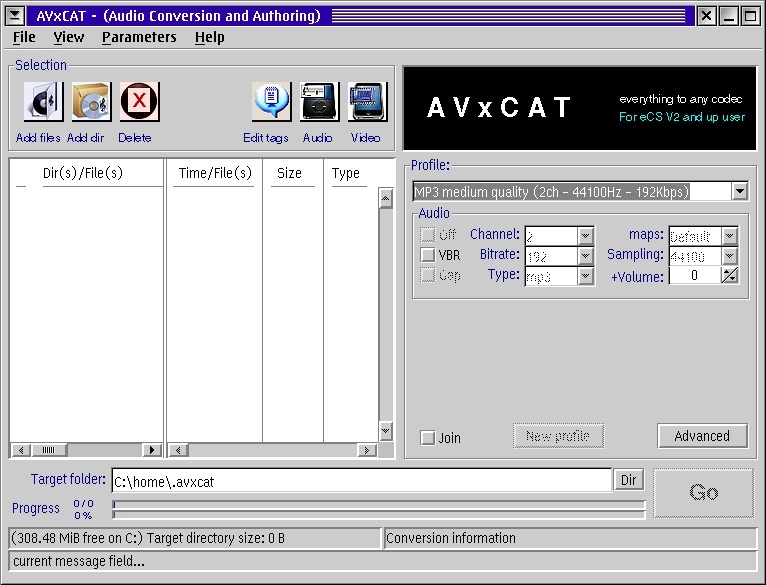 - Changed "Avi OS/2 player compatible" profile to "Avi/mpeg1 OS/2 player 480x360" using maximum successfully tested working size instead of "default"
- increased target path entry field from 34 character length to 128.
list of A/V ext names: ".mpg .wmv .avi .vob .flv .asf .ts .m2ts .mkv .ogv .ogm .mp4 .swf .mov .m4a .3gp .3g2 .mj2 .webm .ogg .mp3 .wma .flac .wav .aac .ac3 .mid .mp2 .mp1 .cda .rmi .rcp .r36 .g18 .g36 .mfi .xrd"
This list can be overwrited manualy adding a key "Files_indir" into avxcat.ini file. The added string must a list of file extension starting with a dot (e.g. .mp4 .mp3) and separated by a blank. 1.0.2 - FFMPEGCA v1.0.2 name changed to "AVxCAT v1.0.0"
- AVxCAT uses a unique pipe name at start time based on "seconds"
- Added --apre --spre Uparms detection and process. - Added support for AMR (only mono, 8000Hz and below 13kbps valid) for futur ffmpeg ! - Now, changing from an older ffmpeg version to a newer one or revers order, updates corresponding new codec entries without recycle. - Added libvpx (vp8) to use with latest Dave's ffmpeg fix. - If a HOME path was set into config.sys, it is used to create a default initial target converted files path home".ffmpegca"
- Added message to inform about ffmpeg pass number in effect for 2 pass process. - Added default profiles for "MKV" and "TS"
- Corrected invalid audio mapping on video file with audio stream when Audio [x]Off is set. - Added a few lower volume level up to be able to generate a silent audio file. - Forced CWMM write on mp3 too like it does it for OGG, WAV, FLAC to resolve a wrong displaied ID3V2 tags under "Track name"
- Now WPS classes for OGG, WAV and FLAC are updated to show IDtags when openening track "properties"
- Added categories under chapter creation for nice presentation. chapter from previously saved categories. - Temporay path used for DVD conversion can be forced using "--vobtemp" which opens a popup window for temporay path name. Enter "DEFVOB" to reset to default. Usefull if temp path is on a RAMFS disk. 6.Full process run in one click using 2 steps. b/ convert the temporary VOB file into the final video file. 5.1 audio stream is supported into this mode. The conversion is done in a piped ffmpeg process. - Corrected stream selection under video advanced option (no stream was previously selected). More than on audio stream can be selected and added into final video file. Sub-title stream is disabled due to rare ffmpeg working condition. - Image is no more refreshed after « hh » or « mm » or « ss » lost of focus to reduce un-necessary image refresh and CPU processing. (SRT, SSA and SUB) usable with different kind of reader. Creating sub-title files has some restrictions like no more than 2 lines could be added for each sub-title part. - Corrected a stop in case of "frame sync error" or "warning: first frame is no keyframe". Now, FFMPEGCA will stop process if total error count of both messages appears above 1000 times. - Added fps value into progress message. - Corrected an invalid remaining time which could occure in some cases following ffmpeg returned message litle change. To create a diaporama, create as many pictures as neede with final size (e.g 320x240) and use incremental naming convention (e.g. IMG0001.BMP). Select an input AUDIO file (required), switch to "view" "video" and select using RMB on the default picture one of the created incremental pictures. on previous build has no effect. 0.7.0 - Added external parameter to fully disable "unwanted id3 tags"
- Corrected possible title set to use ID3V1 is ID3V2 seems not to strange! e.g create 10s samples from all files. - Added a flag '*' in front of any ID tags usable for metadata. - Disabled DRREXX window to appear in case of unpredictable error. 0.4.4 - Added "Open target folder" option under "View"